BizInt Smart Charts Drug Development Suite supports importing drug records from Cortellis (from Clarivate Analytics.) These tables can then be combined with tables created from other drug pipeline databases. Clinical trial data in Cortellis, including the enhanced content in Cortellis CTI, is also supported in the BizInt Smart Charts Drug Development Suite. BizInt Smart Charts for Patents supports importing patents records from Cortellis. These tables can then be combined with tables created from other patent databases. Cortellis currently allows a maximum of 500 records to be exported. If you have a larger search result set, you can exports results in sets of 500. Select the records you want to export and click on the Export option in the Search Results page. You will be presented with the Export screen. 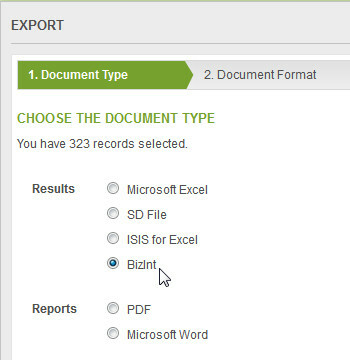 Select the "BizInt" option in Step 1, then click Next. In Step 2, choose if you want structure images to be included in your export, then click Export. If your search returns more than 500 results, export each batch of records, create the charts, and then use File|Combine to create a single file with the results. 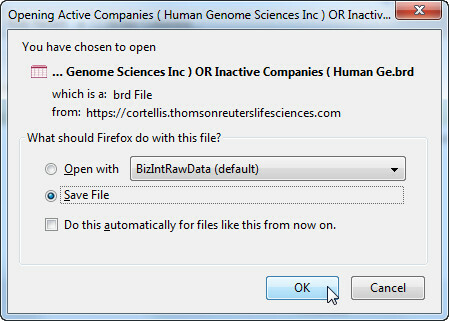 In the final step, choose whether to open or save the exported file. We recommend that you Save the file so you can re-import it at a later date if necessary. Drug pipeline and clinical trials exports will have a .brd (BizInt Raw Data) file extension; patents exports will have a .bpd (BizInt Patent Data) file extension.